ThatRaymond.com | Now in color! Here is a link to the python file on sourceforge. It is sometimes hard to remember that we cannot just simply start a process and then leave it be and assume it will finish of its own volition. Whether referring to child rearing, gardening, politics, or any other number of things – once you start something, you must finish it. Yesterday we had to lay our son, Ashes, down to rest. He was 14 years old and had been with us since we were a young couple in college. I loved that cat more than I realized. He helped me through many of my struggles with panic and anxiety over the years. We miss you, Ashes. RSS displayed with PHP – Updated! Posted in Upgrade, Web/Internet	| Comments Off on RSS displayed with PHP – Updated! Our school district had a need where we wanted to have the no school notice show on all of our district pages when an alert is sent out. I wanted to automate the process so that there wouldn’t need to be any intervention last minute. The alert system we use, Alert Solutions, has an option to output to an RSS feed. By using this and a small amount of PHP, I was able to get the alerts to show up on the site automatically and display for 18 hours without any special intervention other than when the admin makes the notification, they have to remember to check the “RSS” box as well. The issue became that the RSS feed never lets go of any posts, and on top of that, it outputs the oldest at the top. To fix this, we look for the number of keys, then pull only the latest key. This means that we are only looking at the most recent entry. If it is less than 18 hours old, it is displayed automatically. Otherwise the div is set to display:none; and doesn’t show. //Set $end_date for when RSS expires. Calculation entered as (hours*secondsperhour). For a total of $124 plus tax, I have everything I need to perform the cleaning. Considering it was going to be $200 to have it done professionally, this was good. Also, next time it is only $6 for the vinegar. Of note, I already had the tankless coil isolator valves plumbed in, if you don’t have these you will need them and they cost about $60 for the set. Procedure: Turn off boiler, let it cool down to at 110F or cooler. Put pump in 5 gallon bucket. Fill bucket with 2 gallons of vinegar. Hook one hose from top of pump to one end of the coil. Hook other hose from remaining coil hookup and put the loose end into the bucket. Turn isolator valves off from water main and on to the pump and exit hose. Plug in pump, let it run for 1-2 hours. After that, I drained the vinegar and did the same process with clean water for a few minutes to get all the vinegar out. It worked perfectly for us and is a known DIY solution, but I thought I’d share it here for you folks! Driveway alignment, do it yourself! I’ve always been under the assumption that alignments should only be done by professionals on an alignment rack. While I do still believe that this will give the best results, in a pinch, it can be done in the driveway as long as you are looking for zeroing out your toe adjustment. It worked well for me as my Subaru Forester prefers zero toe-in anyway. Simply use a piece of string and attach it somewhere behind the rear wheels (license plate or trailer hitch works well). Then bring the string half way up the rear wheel and up to the front of the car, half way up the front wheels. Adjust the tie rod end until the front tire touches the string at both points it crosses the rubber (front and rear of the front tire). Posted in Cars, Trucks and Tractors, Hobbies, Home and Homestead	| Comments Off on Driveway alignment, do it yourself! I’ve been riding my new 1×8 setup for a few months now and I have to say, I’m sold. I really love the simplicity and don’t feel like I’m really missing out on anything. With my shorter 165mm crank arms, I don’t really spin out until above 25mph, which is more than plenty on a trail bike. I would like some lower gearing, and I plan on replacing my 11-30 cassette for an 11-34. I can definitely see where an 11-40 10spd or 11spd would come in handy, but I think I can make plenty of action happen on the old 8. I’ve even been adding some trail around the homestead, that has been really fun and the kids enjoy it too! I do need to get over to the Wilder Hill Trails here in town as well as the Freedom Trails behind MSLC in Skowhegan. I can’t wait to try out the new local trails, Wilder Hill Trails in Norridgewock. 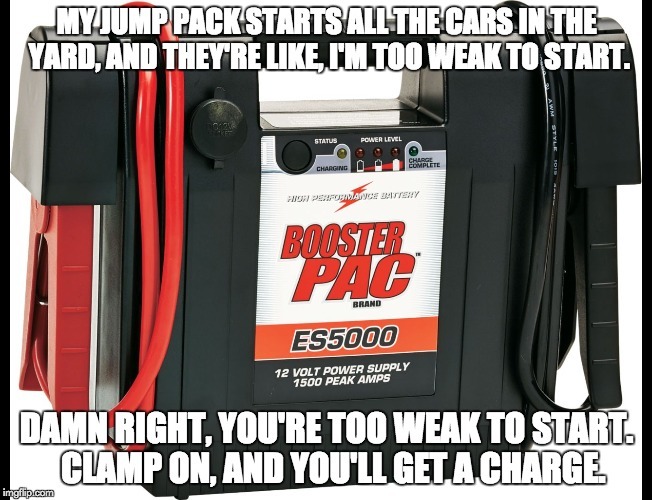 Posted in Memes	| Comments Off on Jump Pack Meme!